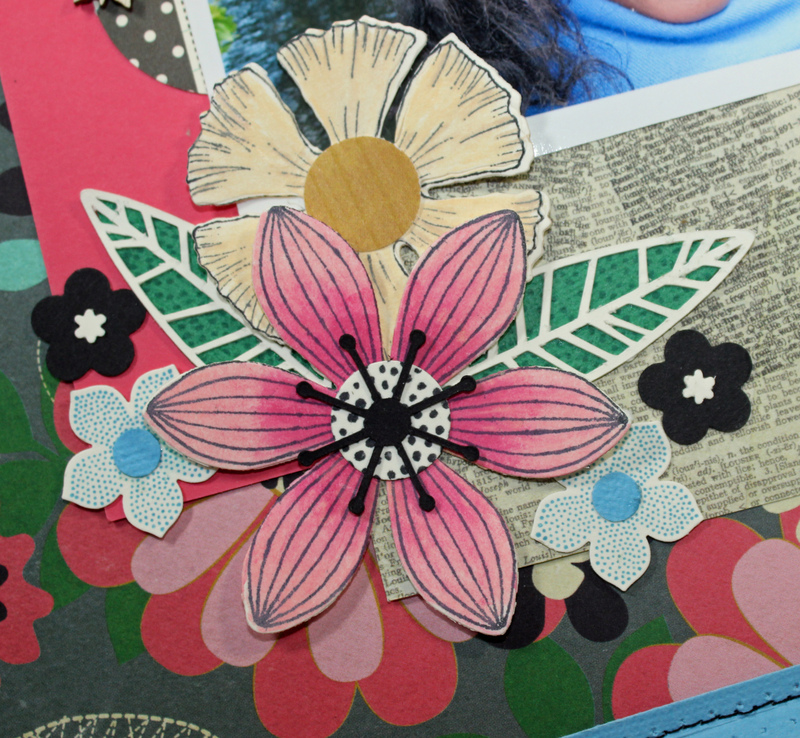 The great thing about paper crafting is being able to color! Now, staying in the lines is a must but not so hard when you have beautiful floral stamps (Heartfelt Creations.. swoon) and matching dies. So for this Flower Power segment I played with colored pencils. Not quite the Crayolas from my childhood but a selection of Prismacolor artist pencils. My amateur Copic abilities have been highlighted on more than one occasion on the ole blog. Practice definitely makes perfect when blending with Copics. Colored pencils with the magic of gamsol is an altogether different story, even I can come across as a blending professional. A couple of swipes with the colored pencils in two shades blended with gamsol really set off the flowers in this layout. Another great effect of colored pencils is the more muted effect that works better with the color profile and cream tones of the Fancy Pants Design papers in the As You Wish collection. 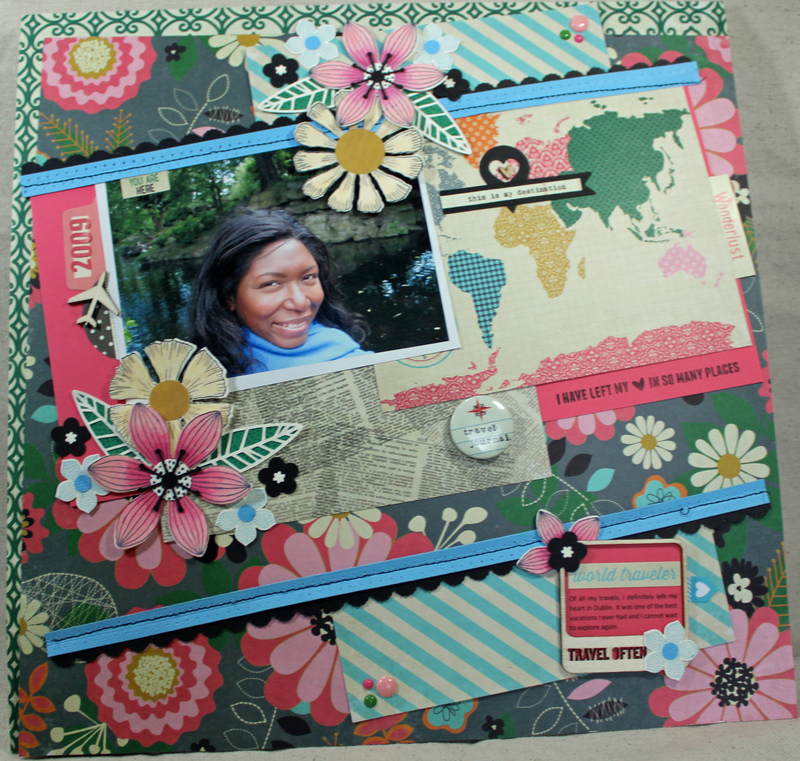 This layout is one of my favorites- it is the perfect pairing of floral prints, stamping and paper layering. Title: this is my destination. Cardstock: Stampin Up (Primrose Petals), American Crafts (Ocean, Evergreen). Patterned Paper: Fancy Pants- As You Wish (Dreamer, Today, 6×6 paper pad-Dictionary, World Travels). 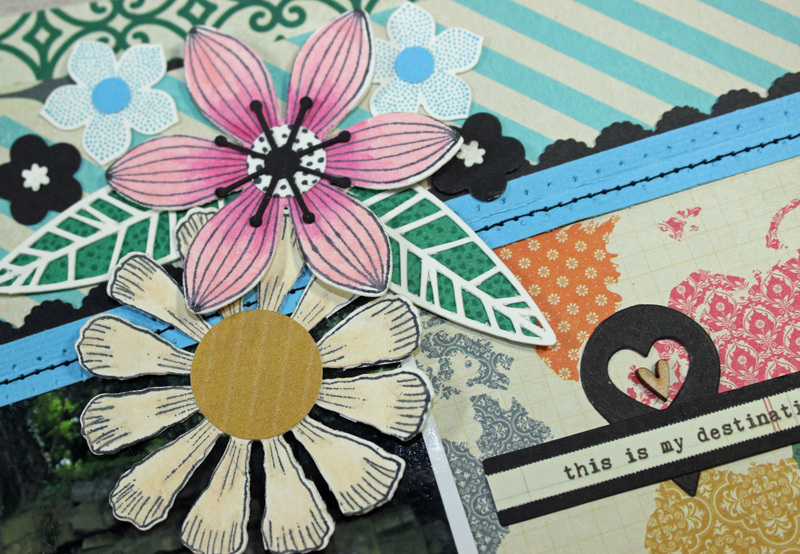 Stamps: Heartfelt Creations (Striped Sun Kissed Fleur, Flowering Carnations 1 and 2); Stampin Up (Petite Petals); Kelly Purkey (Let’s Go); Impression Obsession (Cover a Card Fluff). Die Cut & Punches: Heartfelt Creations (Sun Kissed Fleur); Spellbinders (Carnation Creations); Studio Calico (Heart Geotag); Stampin Up (Petite Petals, 3/8 circle punch), Silhouette Studio Design (8-petal flowers #17645, 3d chrysanthemum #43491); EK Success (Scalloped Scallop; Mini Punch Flower; ½ Circle punch); Marvy Uchida (5/8 Circle punch). Embossing Folder: Quickutz. Embellishments: Fancy Pants- As You Wish (Sticker Fundamentals); Studio Calico (Wood Veneer); American Crafts (Mayberry- Chalkboard Stickers); Basic Grey (What’s Up- Flair, Basics- Enamel Dots); My Mind’s Eye (Cut & Paste- Enamel Dots); Twine + Ink (Enamel Dots); October Afternoon (Woodland Park- Tidbits); Simple Stories (Snap Collection- DIY stickers). Inks: Tim Holtz Distress Ink (Pine Needles); Momento (Tuxedo Black); Prismacolor pencils. The flowers in the layout looks so real..almost so that I could touch them. Beautiful colors. Throwback Thursday: Let’s Go Back. 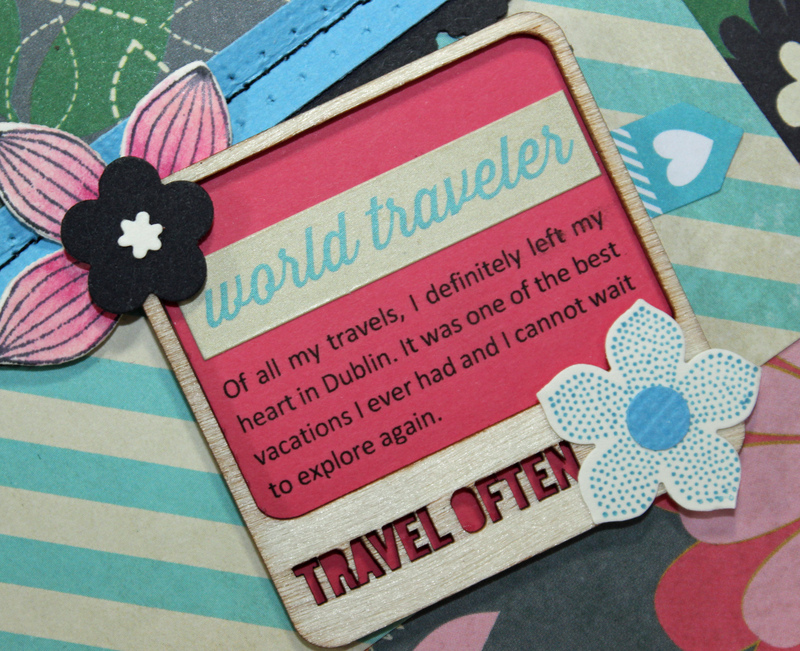 Love of all things scrapbooking, beagles and travelling!